The smartphone market has already been jammed with a lot of brands who are adroit at rolling out a new smartphone regularly. In such a scenario, making a new entry demands something unique for a smartphone to stand out from others. Well, to our surprise a Bangalore-based company has just stirred a new side of smartphone consumers by announcing monthly updates for their upcoming flagship, CREO Mark 1. Now an Indian company coming up with such a deal for there to be customers is not a usual phenomenon. So let us analyze what can go right or wrong with this move of CREO. CREO is a consumer based technology company who will be making a debut with their first smartphone in the market very soon. For those who don’t know, CREO hold the tag of launching the best-known competitor for Chromecast called Tewee. However, now that CREO has decided to step on the floor and conquer the smartphone industry in India and hopefully in the world in coming years, it had to bring in something which can catch all the eyes. Well, CREO has claimed that they will be rolling out an update in their smartphone Mark 1 every month post it’s launch in the market. Now this I would say is an eccentric marketing strategy as being a customer I would have a anytime desire a smartphone that surprises me every month with some new updates. According to CREO, they will be pulling the data from the userbase and based upon that release new updates every month. CREO Mark 1 has been built to fit the pockets of a middle-class person and hence will not be among those high-end smartphones. Hence, the company has hit the target very well by pulling the large chunk of customers in the price range. Talking about CREO Mark 1, the smartphone will run on Fuel OS, which is a modified version of Android 5.1. The CREO Mark 1 is encapsulated in a metallic case in front and the back. The software specifications are still unknown, but Mark 1 has surely left a footprint which all of us will follow till it gets launched. CREO has already released a teaser of Mark 1 and trust me it will make you wish for the smartphone badly. 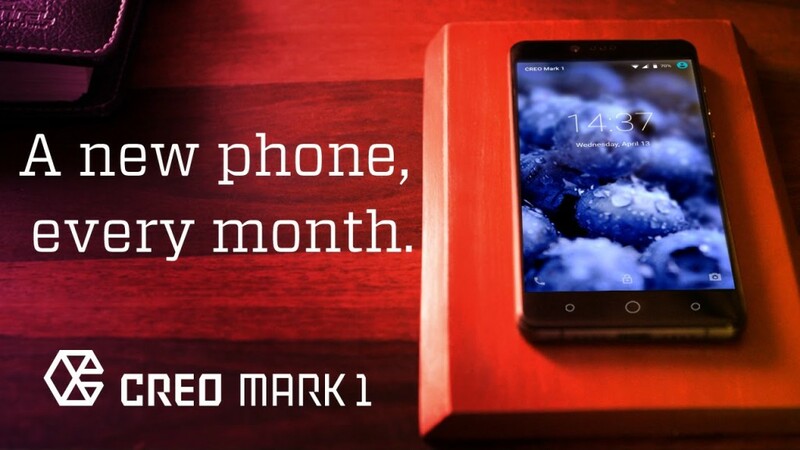 The tagline of Mark 1 goes something like this, “A new phone every month”. Taking heed of the video, CREO Mark 1 doesn’t seem just another smartphone in the market. And the claims of CREO regarding a new update every month further adds a quirk in it’s characteristics. Though there are a few factors which will influence the way people perceive the smartphone which includes the software specifications and the price of Mark 1 which are yet to be released. But for the time being, CREO Mark 1 has grabbed the eyeballs from all the corners. All the leading online tech dailies have already covered the CREO Mark 1 and the stage has been set. Now we shall wait till the company officially launch the CREO Mark 1 on April 13th, 2016. It will be amusing to witness a Bangalore based startup climb the Indian smartphone market.